The half term Autumn entertainment continues this Saturday with a kids treasure hunt along Central Road. Thanks to the support of Paul (new Manager of Worcester Park’s Sainsbury’s Local) and Daniel (Manager of Worcester Park’s Haart estate agents), Worcester Park’s children have the opportunity to complete an autumn themed treasure hunt this Saturday (Halloween). You’ve probably already seen posters like the one featured here dotted around the shop windows in and around Central Road. On Saturday, from 10am, children will be able to pick up a form at Sainsbury's Local in Worcester Park [or download it from here] and write the names of some of the shops where they discover the same poster in the shop window. On filling the form with the names of 25 participating shops, children can present the completed form at Sainsbury’s and Haart, where they’ll receive some treats from both shops. Sainsbury’s will have 100 forms available and both shops will have 100 lots of treats, which they’ll give out from 10am until 2pm, or until they run out. Best aim to start at 10am to avoid disappointment. All you’ll need to bring with you is a pen to write the names of the shops on your entry form. You’ll note that the form in the shop windows focuses on local autumn views, rather than explicitly ‘Halloween’. In an effort to make this activity as inclusive as possible I’ve avoided any controversial imagery. And to make this a truly local treasure hunt, I thought it was an opportunity to show the beauty of autumn colours that you can see in KT4 at this time of year. Besides, it’s clear not everyone is keen on ‘trick or treating’, which is seen by some as hostile begging. So rather than have your children knock on your (possibly elderly) neighbours’ doors and with a confrontational, 'Trick or treat! ', here’s an alternative challenge for younger residents to have test their observational powers in the high street, with some treats at the end of it." 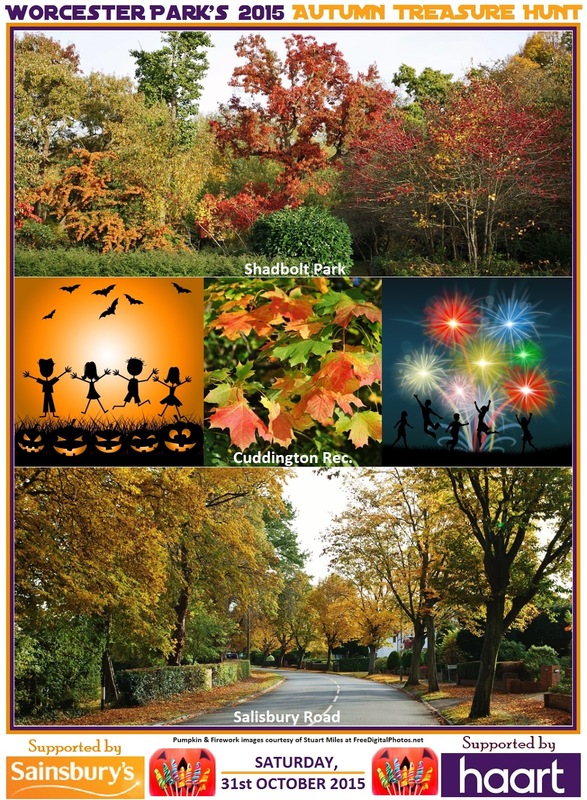 Download the entry form here - and go and find those Autumn pictures!